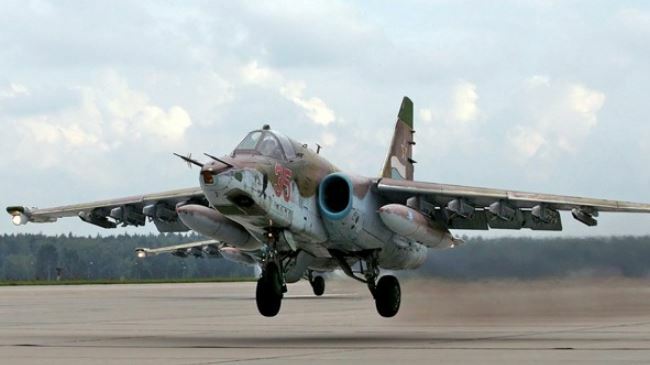 File photo shows Russian-made Sukhoi Su-25 jets operated by the Iraqi Air Force. Iraqi fighter jets have targeted several hideouts of ISIL terrorists besieging Shia Turkmen town of Amerli, security sources say. Iraqi security officials said on Wednesday that the warplanes carried out nine airstrikes against the militants surrounding the volatile town in the northern Salahuddin Province. The residents of this small Shia Turkmen community about 180 km (110 miles) north of Baghdad have been living under the ISIL siege for more than two months. Figures show some 12,000 Turkmens are trapped in the town with food, water and medical supplies running out. UN Iraq envoy, Nickolay Mladenov, has warned that Shia residents of Amerli could be massacred if urgent action is not taken to rescue them. International organizations have also warned about the deteriorating humanitarian situation in the troubled region. “The people are still besieged and stranded there,” said Eliana Nabaa, the spokeswoman for the UN mission in Iraq. Western media reports say President Barack Obama is nearing a decision to authorize air raids and aid drops in the area. The ISIL terrorists have threatened various communities, including Shias, Sunnis, Kurds, Christians and Izadi Kurds, during their advances in Iraq. Several gruesome video footages were released, purportedly showing members of the ISIL Takfiri terror group brutally killing Shia Muslims in drive-by shootings in Iraq. The terrorist group has links with Saudi intelligence and is believed to be indirectly supported by the Israeli regime.